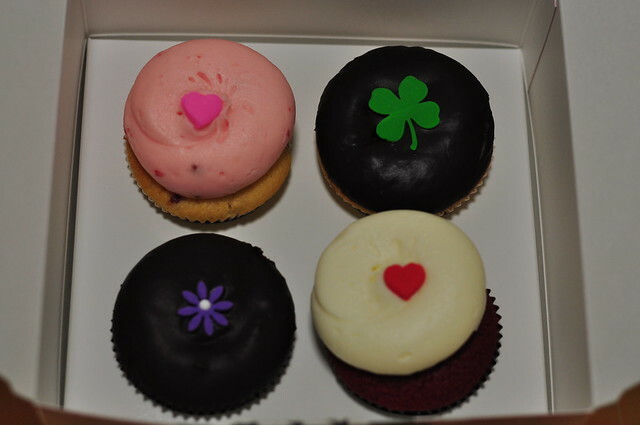 However, I was curious as to why Georgetown Cupcake was so popular. Every episode you see, there’s always a big line outside the door, or maybe they just use the same footage of the line. Either way, they are popular in some aspect. Since they were only on the East Coast, I wasn’t able to try it. But now… they recently opened a bakery in LA. This is more do-able! D- and I recently visited his parents in LA, so we got a chance to stop by the LA location. I loved the decor of the place. It looked very clean and modern. It wasn’t at all crowded. I just picked out a few cupcakes to order that stood out to me. I was tempted to order one of each flavor, but my belly would be much bigger now. A given flavor for me was the red velvet. 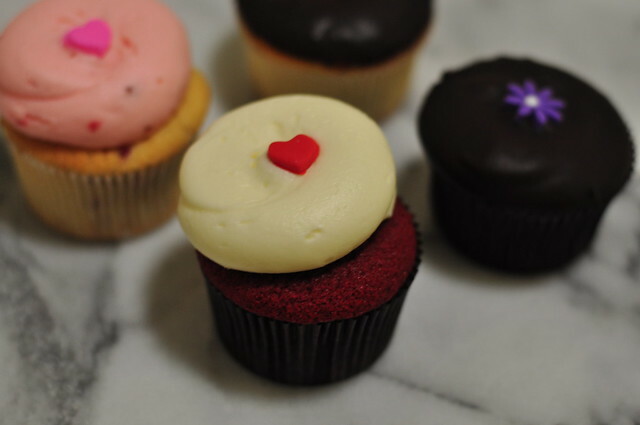 Each cupcake shop should sell a red velvet, no matter what. You can kind of judge how well the other cupcakes would be based on this standard cupcake. I must say, this cupcake is one of the best red velvet’s I’ve tried. There is a great frosting to cake ratio and the cake was moist. I also thought the frosting wasn’t super sweet… a big plus in my book. I decided to get one “special” flavor. 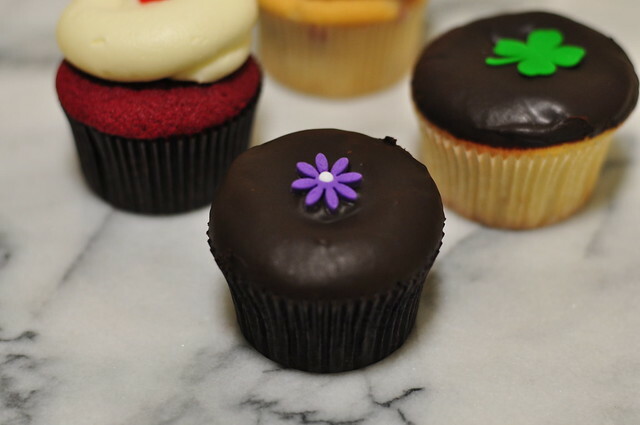 Georgetown Cupcake has a few special flavors each month. When I went back in March, this Boston Creme cupcake was one of them. I must say that this one didn’t taste as good as I’d hoped. It was kind of bland and the flavor wasn’t very distinct to me. I’m sad to say this, but luckily this isn’t a permanent flavor. D- chose this one. I liked the reason he chose it. We watch a lot of cooking shows and we always hear chefs use ganache in their desserts. 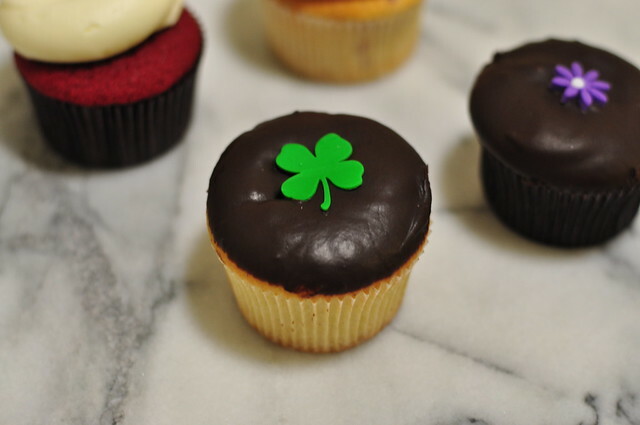 We’ve never tried ganache, so that’s why we decided to get this cupcake… Chocolate Ganache! This one is pretty fantastic. I enjoyed the richness of the chocolate. 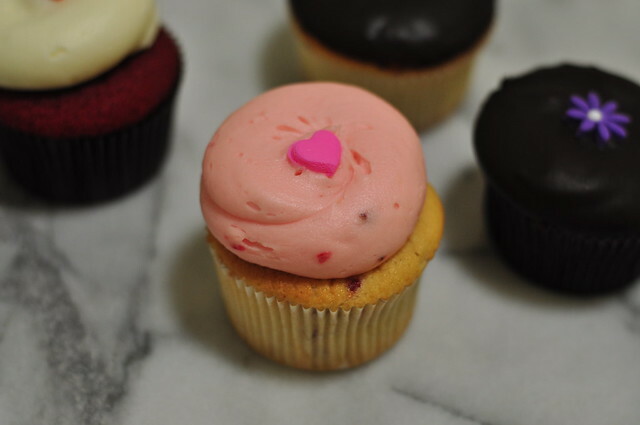 Although, I must admit… I should have blogged about these cupcakes sooner. I kind of forgot how this one tasted like. I think it’s time to order some again! 😛 Anyway, I just remember it was one of my favorites! My favorite is saved for last! I had to order a strawberry-flavored cupcake! The frosting tasted so fresh and the texture was so smooth. I was definitely not disappointed with this one! I’m so glad we came on a day where they served this one. They alternate flavors every few days. My absolute favorite thing about Georgetown Cupcake is the subtle fondant decor. I love how they make the cupcakes so much cuter with just a little decoration. That’s my kind of style.